5 NORTHBLUE Minnesota LOWBUSH Blueberry Plants, 2 Year Old, 1 Quart Sized Plant Shipped Bare Root! The best time to buy a blueberry plant is in the early to mid-spring, before the frost. The best time to plant it is in the winter. Before buying, look at the fruit and leaf buds on the blueberry plants in spring. A healthy plant will produce an abundant amount of bud. Gently touch and inspect the buds, plant with buds that brush off are usually water stressed. Check the leaves for discoloration. Black spots are signs of plant disease. Yellow or orange veins running through the leaves are not normal. Choose a 2 or 3 year old plant because it will survive transplanting than smaller plants. Examine the roots and do not pick a blueberry plant with weak or underdeveloped roots. Once you have chosen your blueberry plant and you are ready to plant, make sure your soil is specifically acidic. Blueberry plants thrive well in acidic environment unlike other plants. Planting it in a different type of soil may reduce its blooms and fruits. You may incorporate elemental sulfur or aluminum sulfate to make your soil acidic. 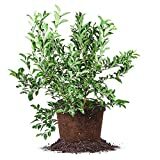 But since artificial acid can leach easily into the soil, it is recommended to plant your blueberries in a container to maintain the acidity longer. Another option is to mix a bucketful of composted leaves or pine needles in each planting hole. This will not only prolong the acidity but also provide a long lasting source of humus necessary for optimum nutrition, aeration and moisture. Spread a three-inch layer of organic mulch over the ground. This will ward off weeds and keep the roots moist and cool. Once the plant is settled, give your blueberry one to two inches of water weekly during its growing season. Avoid overwatering; your blueberry plant does not like having wet feet. If you have alkaline water in your area, acidify it first with two teaspoons of vinegar per gallon. For the first three year of life, no pruning will be necessary for your blueberry plant. You may remove fruit buds for the first two years after planting to allow the bush to establish itself. After which, you may prune annually in the late part of winter. 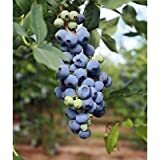 Blueberry plants do not like rich soil but fertilizers may become necessary if the plant growth is less than a foot in annual basis. Organic fertilizers are ideal for blueberries because they are less likely to burn the plants’ tender roots and because they supply nitrogen in a form blueberries use best. It will usually take 2-3 years for your blueberry plant to bear fruits in spring or summer. Birds are also fond of these juicy berries, so take extra care and cover your plants with bird-proof netting. Blueberries actually don’t reach their full flavor and aroma until a few days after they turn blue. So patience is the key before you can fully enjoy your blueberry fresh from the bush.